◾Over 1/3 to 1/4 of the Indian Pangolin’s weight is from its scales. ◾The Indian Pangolin’s scales are made out of the same material as the human fingernail – Keratin. ◾Indian Pangolins have a highly developed problem-solving brain, and are capable of using it in the wild, and to escape back to the wild when in captivity. 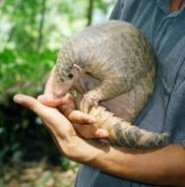 ◾Indian Pangolins cannot walk on their front claws like other pangolins do, so they curl them back and walk on their knuckles.